This time we are going to talk about how to expose our AWS lambda function over HTTP. 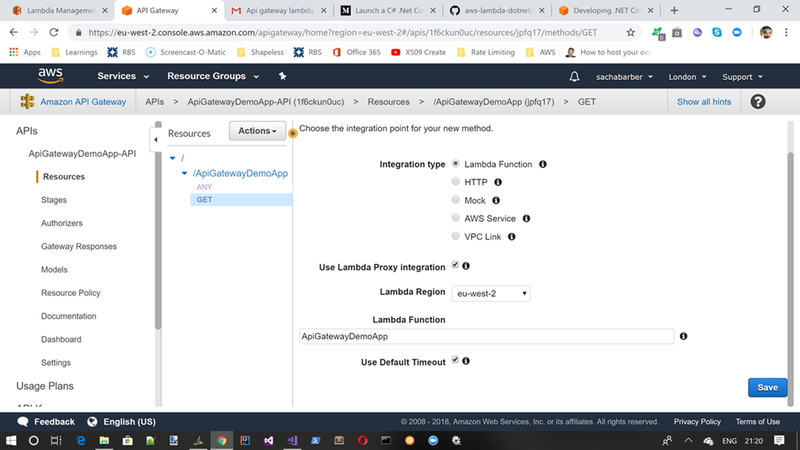 This is actually fairly simple to do so this will not be a big post, and will certainly build on what we saw in the last post where I introduced how to create and publish a new AWS lambda function. 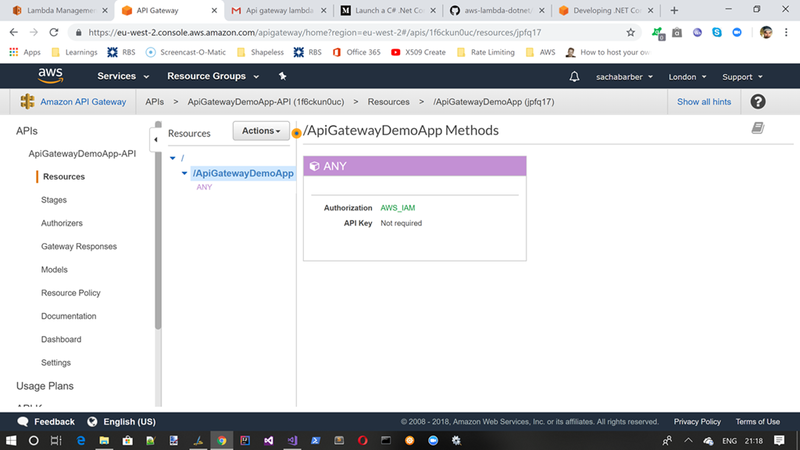 Amazon API Gateway is an AWS service that enables developers to create, publish, maintain, monitor, and secure APIs at any scale. You can create APIs that access AWS or other web services, as well as data stored in the AWS Cloud. 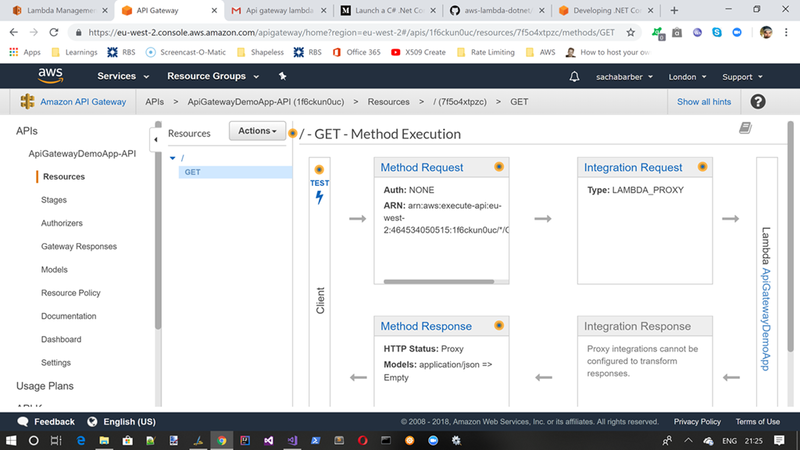 In practical terms, API Gateway lets you create, configure, and host a RESTful API to enable applications to access the AWS Cloud. For example, an application can call an API in API Gateway to upload a user’s annual income and expense data to Amazon Simple Storage Service or Amazon DynamoDB, process the data in AWS Lambda to compute tax owed, and file a tax return via the IRS website. 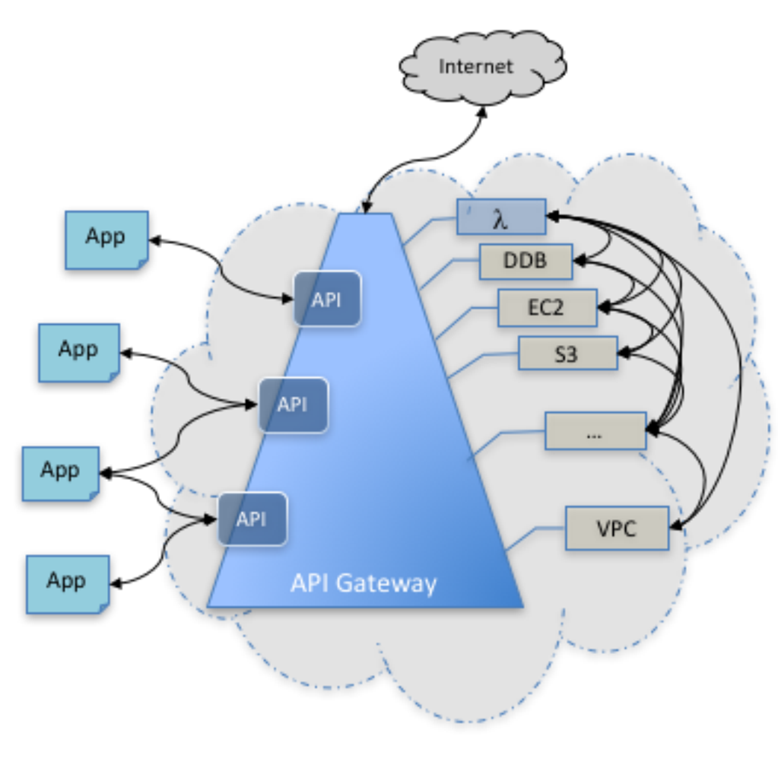 As shown in the diagram, an app (or client application) gains programmatic access to AWS services, or a website on the internet, through one or more APIs, which are hosted in API Gateway. The app is at the API’s frontend. The integrated AWS services and websites are located at the API’s backend. In API Gateway, the frontend is encapsulated by method requests and method responses, and the backend is encapsulated by integration requests and integration responses. 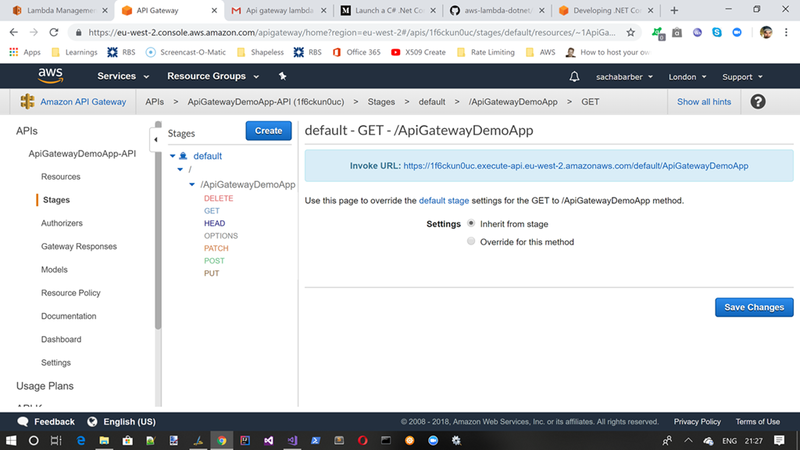 With Amazon API Gateway, you can build an API to provide your users with an integrated and consistent developer experience to build AWS cloud-based applications. int statusCode = (result != null) ? string body = (result != null) ? In this example we are exposing the AWS Lambda as a GET only operation. If you wanted to accept POST/DELETE/PUT data you could use the APIGatewayProxyRequest.Body to get the data representing the request. Ok, so now that we have the code, and lets assume that the Lambda has been published to AWS (see the last article for a detailed explanation of how to do that). 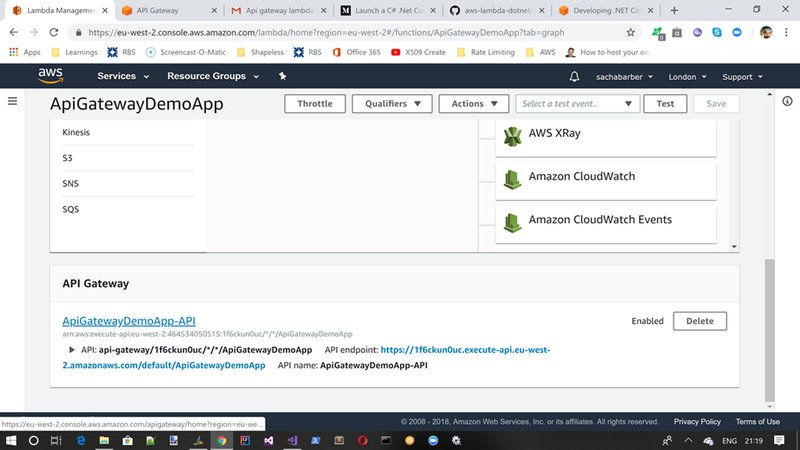 For now lets assume we have published the above code to AWS, and we have it available in the AWS console, we would now need to configure the API Gateway part of it. Once we have configured the ApiGateway trigger for the published lambda, we should see it shown something like the screen shot below. We then need to move on to setting up the actual ApiGateway resources themselves and how they relate to the Lambda call. 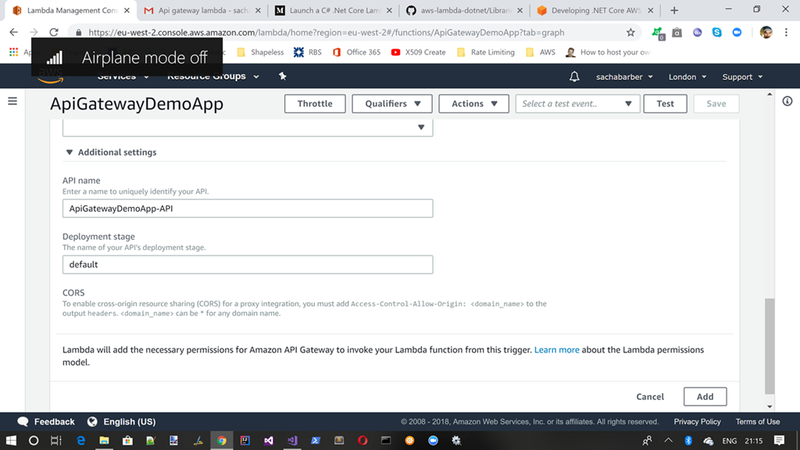 We can do this either by following the link shown within the Api Gateway section of our lambda as shown above, or via the AWS console where we just search for the Api Gateway. Both paths are valid, and should lead you to a screen something like the one below. It is from this screen that we will add new resources. So if that tests out just fine, we are almost there. All we need to do now ensure that the Api Gateway is deployed. This can be done using the “Deploy API” menu option from the Api Gateway portal, as shown below. 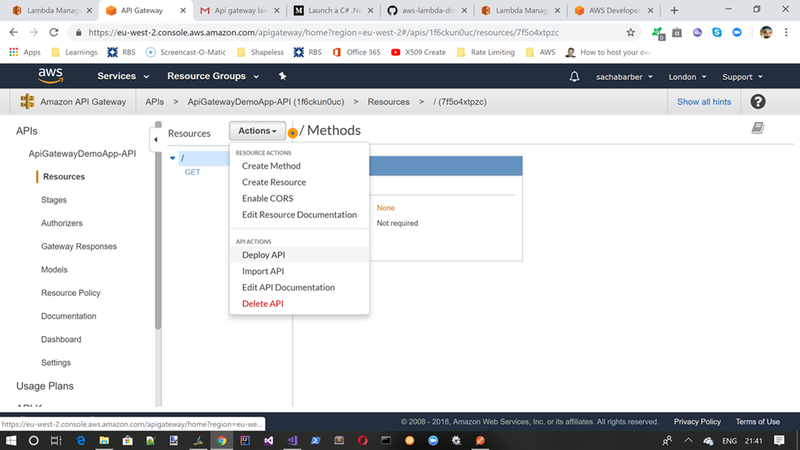 With all that done, we should be able to test our deployed Api Gateway pointing to our Lambda, so lets grab the public endpoint for the Api Gateway, which we can do my examining the Stages menu, then finding our resource (GET in this case) and getting hold of the Invoke Url. Cool looks like its working. Ugh. You hard coded ‘content-type’ rather than passing it via your request. Second, ‘access-allow-orgins’ should be in a separate cors class where you should be doing checking; right now you are allowing ALL traffic through so effectively, I can act as a proxy for your server and DDS you. Finally, you are not handling security locally so there is no synchronization of the roles/authorities between the proxy and endpoint leading to elevated privileges. Yeah sure I could have passed it through via request no problem on that one. With this series of posts, I am trying not to get too involved with the perfect post, its more a beginners guide. Well CORS is alot more than what you have. You left out the security component to CORS as well as potential for blacklisting/whitelisting. This is why you have it be a separate class.